Karnataka is clearly a state that loves food. They don’t just love food, but they come up with their own recipes as well. No South Indian can be away from a masala dosa or Mysore rasam. Who can resist the melt in the mouth, made out of pure ghee Mysore Pak? All these are from the state of Karnataka. Their akki rotis (rice rotis) are famous and delicious. And their ragi mudde is not only cooling to the body, but healthy as well. And do you know that kesari, yes – our own sweet semolina kesari, is originally from Karnataka? The wiki says so. Clearly a state that loves and experiments with food! Bisibela bath is another famous dish from Karnataka. 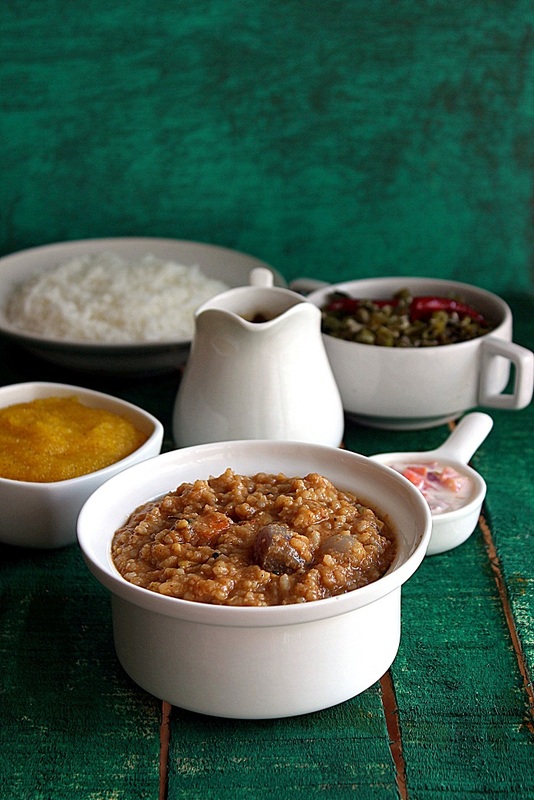 It’s our sambar rice, but with a little bit of twist. The basic formula is this : Cook rice, dal and veggies together. Roast and grind masalas for sambar powder along with roasted coconut. Boil tamarind water,salt and let the masala paste cook. Add the rice-dal-veggies to it and adjust the consistency. It’s better if it’s slightly on the gravy-ish side since the rice solidifies as it sides. All it needs is a simple raita to go along with it. Add on a pappadam/fries and you have a feast! Like in most of the Southern Indian states, Karnataka too prefers rice a lot. 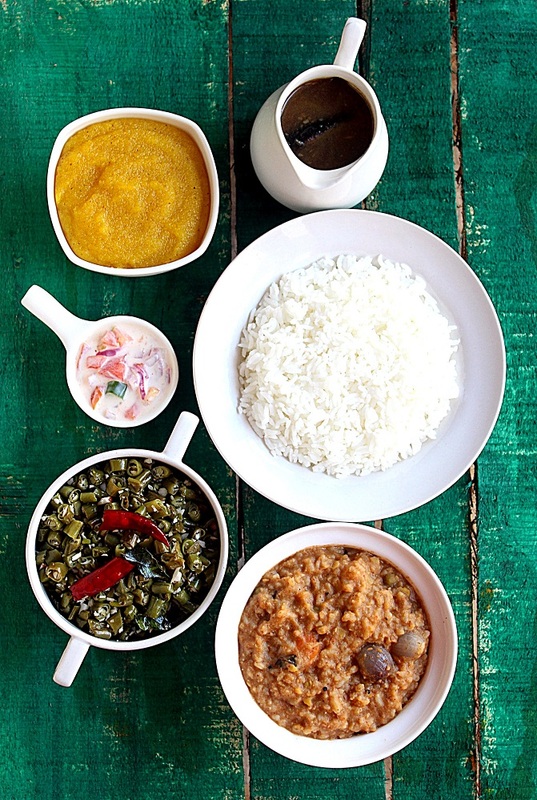 Their regular cooking has a gravy based dish(varieties of sambar and rasam) and a veggie to go with it. The veggies can be anything, prepared in a basic – cook it, season it, serve it kind. A bit of coconut is added and it’s called palya. If it’s carrots, that’s made – then carrot palya. 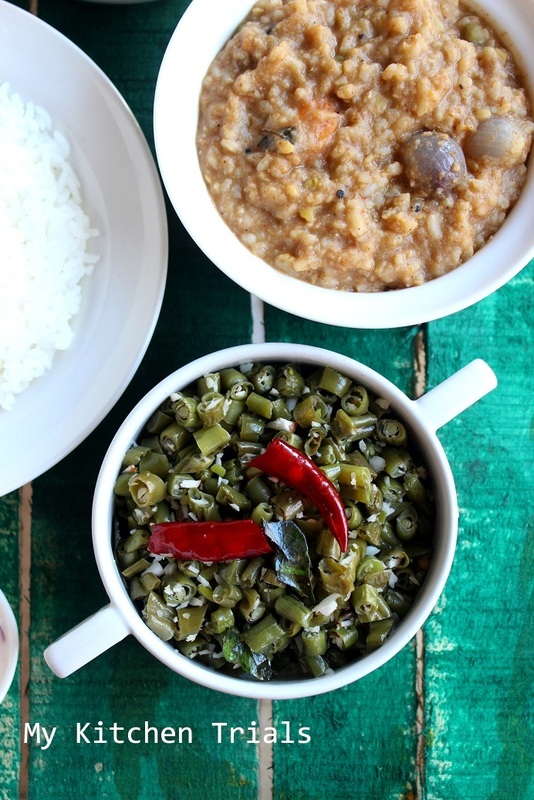 If it’s cabbage, it’s cabbage palya and here I have beans palya. A simple uncomplicated way of having your veggies. Give or take a few spices, this basic side dish is same for most of the South. 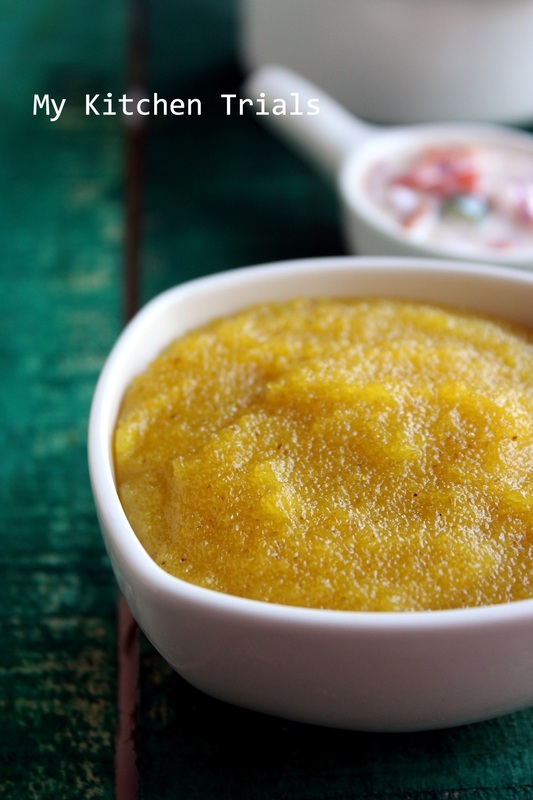 Rava kesari is an often featured sweet in Indian homes. It goes by different names in different states. The basic preparation is almost the same. It’s called halwa in the North, Kesari in Tamil Nadu and Kerala and kesari bhath in Karnataka. It’s basically roasted semolina cooked with sugar. Sugar syrup is made and then semolina is added to it or you can roast the rava, add water and then add sugar. I prefer the second method, since my sugar syrup making capabilities are questionable. The end result is delicious in both methods and you can make it better by adjusting the sugar measurement according to your taste preference. 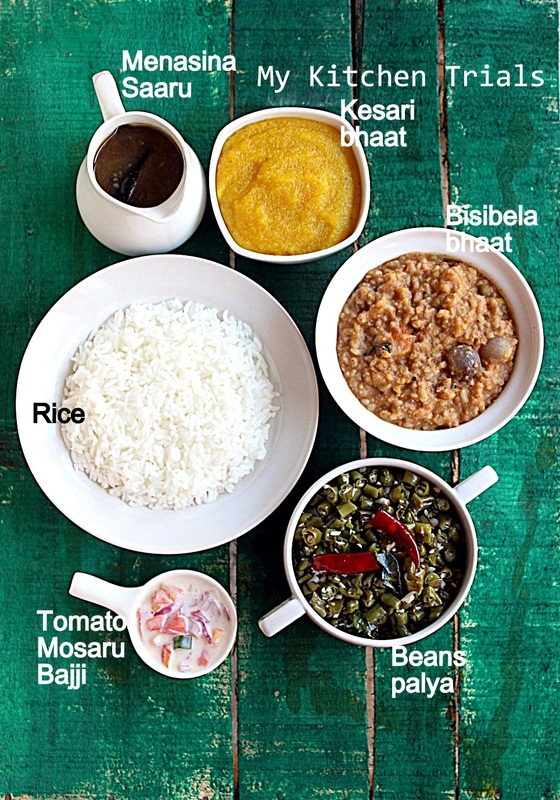 Bisibela Bath : A version of Sambar rice where in you have to roast and grind the masalas and then add in already cooked rice and dal. Simple elegant way of capturing the essence of Karnataka ! Rajani you sum up things so well..loving the kesari and my mouth is watering..glad to have a virtual treat, as I am off sweets!! ( what a way to console). That’s such a tempting spread Rajani..always find it amusing when different ppl say differently about kesari..your BBB has the right consistency..
BBB is just torturing me, am drooling over that beautiful dishes, fantastic virtual treat for me. beautiful and delicious spread!!! Bisi Bela Bath is so tempting and drool worthy!! 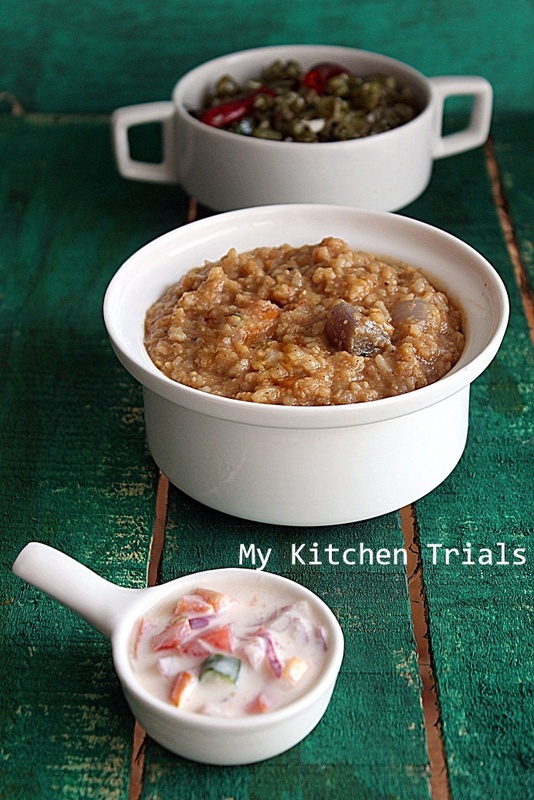 Very tempting clicks and I am loving all your mini meals recipes …. A really nice spread. Kesari has a lovely color and you have great pictures. I love everything there especially BBB which happens to be my most favorite dish. That is one homey, comforting thali. Love your clicks and the serveware looks perfect. beautifully summed up. Rajani I have no words to express what I want to say. Everything looks so delicious! Beans Palya is so inviting. And that kesari baath, yum! Beautiful photography and like the green wooden background.